If you are looking for the STS blog train (Starry Summer Night), see the post below. I am a little late to the Pixel Scrapper blog train, but I think that it´s better late than never. Or, in my case, better a small quality CU portion than a nothing. When I work for Pixel Scrapper blog trains, I try to make restricted comercial use kits because there are some people there that really like Comercial use resources; so, on this case, either I make everything from scratch, or I use only stuff I have CU4CU license, and they come from very few designers. And, as I realised that what I was making from scratch didn´t met the quality standards, I´m trying to make better material, or it will be useless anyway. I have very few experiences with ponds; the only ones I like are the zen ones, with carps, lotus and so on. But the colors of the blog train go better with the muddy full of frogs ones, and the inspiration hasn´t flown like when I did Birds and Bees or Retro Kitchen blog train; so, I made a small pack of papers, including patterned papers, one solid and themed papers too. The carp on the paper was hand drawn by me, and so were the doodles that I´m offering as elements. I also have for you a dragonfly scatter/border that I made based on an element originally offered by Brooke at Pixel Scrapper. I hope you can combine my bit to other parts of this blog train and make some fun layouts! 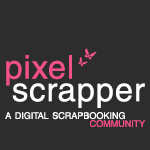 Don´t forget to check the portions other people on Pixel Scrapper community have done. They are really pretty. Click here to see all the previews and blog links of this blog train. I am still not sure if I´ll have time to play at SNP blog train this time, because on that weekend I will go sell my paper cards at a fair, but I will try. If you take a bit longer to hear from me again, don´t worry - I´ll be back as soon as I can with CT work and, of course, freebies! Super fun papers! Thanks for sharing. Thanks Lórien. The carp you drew is awesome. Thank you so much! It looks terrific! thank you for the wonderful part of the blog train. As I have a daughter obsessed with frogs and fish, this fits the bill. Great papers, thanks so much Lorien! Great papers! Thank you very much! Thank you for your contribution to the Sweet Things "Mega Kit" - I'm just in awe of all the talented designers. Thank you doesn't seem nearly enough for all your hard work. I think the finished product is absolutely amazing and I can't wait to use it!! Oh, your papers for the Pond Life blog train are just terrific! Thank you so much!